Glaucus atlanticus is a weird looking species of small-sized blue sea slug, a pelagic aeolid nudibranch*, a marine gastropod mollusk of the Glaucidae family. 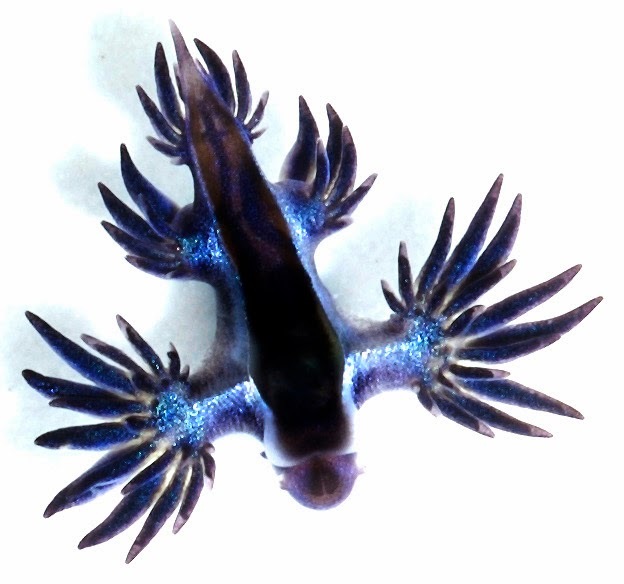 The blue glaucus occurs in temperate and tropical waters throughout the world's oceans. Areas where the slug can be found include the East and South Coast of South Africa, European waters, the east coast of Australia and Mozambique. The species floats upside down on the ocean's surface. The species was discovered during Captain Cook’s second voyage to the Pacific, in HMS Resolution. Aboard the ship were the scientists Johann Reinhold Forster and Johann George Adam Forster (his son) who first described the animal in a 1777 publication. Aboard the ship was also Sydney Parkinson, a Scottish illustrator and natural history artist, who made drawings of the collected specimens. Typically, the species has a length of 5 to 8 cm (2-3 in.). It's silvery gray on its dorsal side and dark and pale blue ventrally. It has dark blue stripes across the edge of its foot (the dorsal side). It has a tapering flattened body with six appendages that branch out into rayed cerata. The species may have up to 84 cerata and the radula comes with serrated teeth. With the aid of a gas-filled sac in its stomach, G. atlanticus floats on the surface. However, due to the sac's placement, the sea swallow floats inverted. The foot and underside have either a blue or blue-white coloration whereas the dorsal surface is covered in a silver-greyish color. This coloration is an example of counter-shading, a form of camouflage that protects the species from predators from below, sides and above. Scientists have often argued whether G. atlanticus moves on its own or if it depends on wind and waves for locomotion. 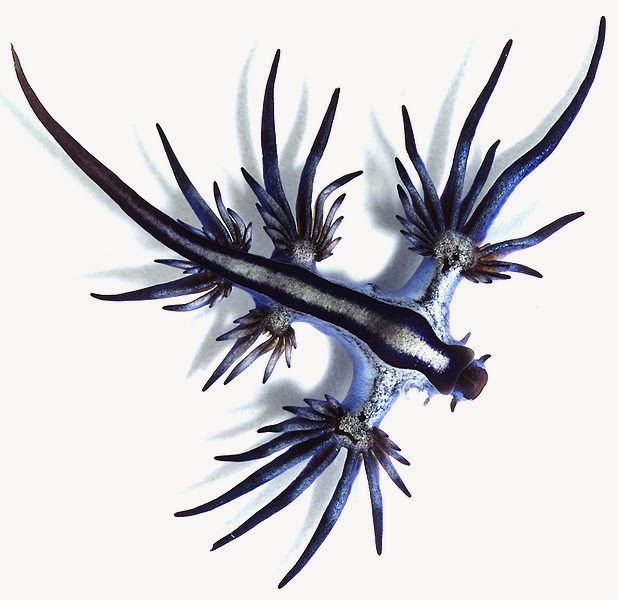 G. atlanticus is commonly known as the blue ocean slug for a good reason. Its vibrantly blue coloration is surely one of the most eye-catching characteristics of this weird animal. This trait wasn’t evolutionary selected for aesthetics purposes, as aforementioned it helps the species to avoid potential predators such as birds flying above the waters it inhabits. Its ventral side, which floats on the ocean's surface, is blue and white, matching the color of the ocean, while its dorsal side, which faces down to the sea bottom, is silvery-greyish, providing again a great match for hiding itself from predators lurking below it. However, blending with the environment is just the first line of defense for this beautiful creature. Interestingly, the blue slug also has the ability to steal its prey’s defenses and use it for its own protection! Like most aeolids, they do this by ingesting the nematocysts of their prey, storing them in special sacs called cnidosacs. The nematocysts are then transferred to the tips of their limb-like outgrowths called "cerata". A research found through microscopy that the nematocysts in G. atlanticus are the same nematocysts found in P. physalis, proving that the sea swallow does in fact obtain these nematocysts from other organisms. This is why picking one up may result in a very painful sting. When sea swallows are out of water, they have a tendency to roll into a little ball and open up again the moment they are placed back into water. They also flip themselves over slowly when placed in the water with their silver-grey surface facing the sky. Occasionally, sea swallows also exhibit cannibalistic behaviour. Like many sea slugs, the blue swallow is hermaphroditic and oviparous. 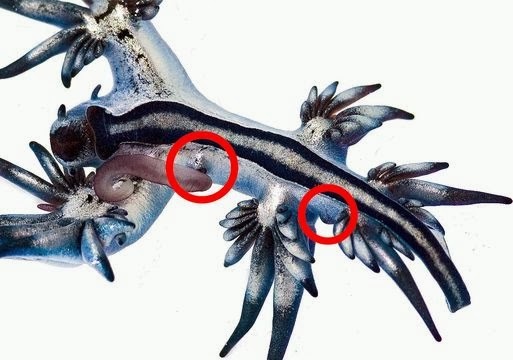 In reality, most sea slugs are hermaphrodite, allowing both slugs to produce egg strings after mating has occured. G.atlanticus has the tendency to lay down its eggs on floating pieces of wood, the remainings of its prey, or any other object or carcass that stays afloat. This enables their young to stay afloat while they develop, until they have air sacs of their own. G. atlanticus has an interesting male reproductive part. The male organ is large and hooked, probably to get around the possibly venomous cerata. 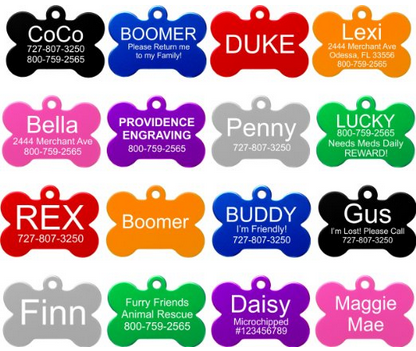 According to "google suggested searches", it seems like there is a high number of people wanting to get one (or more) as pet. Please note that due to its unique diet, keeping the animal in captivity is very difficult next to impossible, thus getting one as pet would most probably result to its death. * A nudibranch is a member of Nudibranchia, a group of soft-bodied, marine gastropod mollusks that shed their shell after the larval stage. These animals are famous for their often extraordinary colors, striking forms and many times alien-like apperanace. Today, there are more than 3,000 described species. 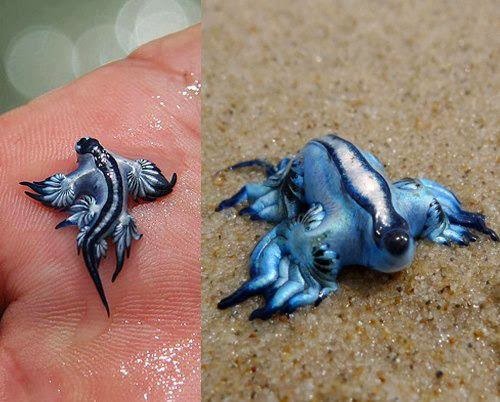 - "Glaucus atlanticus (blue sea slug)". The Natural History Museum. Retrieved 2013-04-13. Can you keep this as a pet? Do you by any chance know where I can by one? Ha ha, I ' m doing a report on school for this too! I was on EOL, but it did not seem that good because its source was wikipedia. What is it's average lifespan? I am genuinely pleased to read this website posts which contains plenty of valuable facts, thanks for providing these statistics.